New Years in Tokyo turned violent when a car slammed into crowds who were celebrating New Year early on Jan. 1. leaving 9 injured. The attack took place in a popular fashion district and tourist area of Harajuku on Takeshita Street, near Meiji Shrine, in central Tokyo. Hundreds were heading to the shrine to pray for good luck, heralding in the New Year. The street had been closed to traffic at the time because large crowds were expected in the area for New Year’s Eve celebrations. Shibuya, literally “Astringent Valley”, is a special ward in Tokyo, Japan. A major commercial and business center, it houses the two busiest railway stations in the world, Shinjuku Station and Shibuya Station. The area is frequented by many tourists. 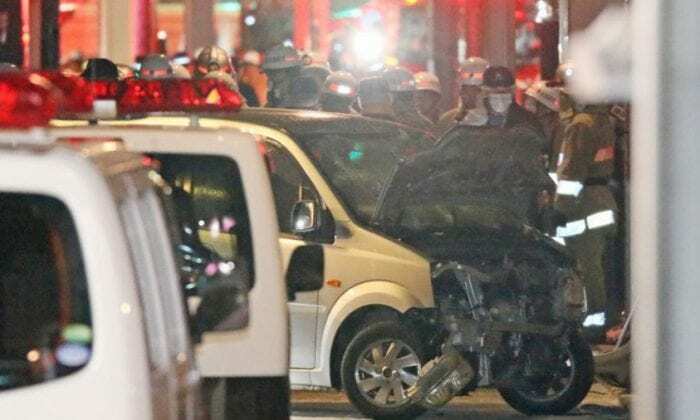 Police said eight people were hurt by the car when it car drove into the crowd, including a young male who was taken to hospital in critical condition, according to Japanese news agency Kyodo. A ninth man was slightly injured after the driver had allegedly struck him after getting out of the car. Teenagers and adults in their 50s are among the victims, according to RT. A police spokesman said a man has been detained over the incident and that he had described the incident as an “act of terror,” Reuters reported. Police and riot police were called to the scene. As of 5 a.m. local time, most people had dispersed from the area, Kyodo reported. Local TV footage showed the small van with a smashed-up front end as ambulance workers and police officers rushed to the scene. Police arrested Kazuhiro Kusakabe, 21, on suspicion of attempted murder. He had been driving a rental car with an Osaka license plate, Kyodo reported.